It is also employed when a product is suspected of causing electromagnetic energy, therefore blocking the waves it creates from affecting outside equipment. Electromagnetic interference is caused by the interaction of two separate magnetic fields produced by different electrical currents. The shielding of wires and cables to limit electromagnetic interference is particularly important because they are abundant in industrial, office, commercial and home environments. As both a receiver and source of electromagnetic interference, insulating wires is necessary to keep EMI at a minimum. Like most electromagnetic shielding products, such as gaskets and filters, wire shielding is made from a variety of metal substances. Among those commonly used is aluminum, nickel, copper and steel. All of the mentioned metals have a high magnetic permeability. Alloys like Mu Metal, which is a trademarked combination of copper, nickel, molybdenum and iron are also often found surrounding wires. Shields for wires may come in a number of different forms. Braided wires can create a mesh coat that wraps around a wire, or a smooth surface jacket can be used to coat the wire instead. Sometimes numerous types of wire shielding are utilized at once to thoroughly deflect electromagnetic interference. Wire may be bought with shielding already in place, or wire shielding kits may be purchased to cover and protect already installed bare wires. The type of shielding chosen depends on many factors, including the wire diameters and the amount necessary to cover all the wires in an environment. The shielding works by way of deflection, or by conducting the energy into the ground rather then into the wire it is protecting. Other forms of EMI shielding also work in this fashion, although the shape may be vastly different. For example, EMI coating is a spray on liquid that hardens on the surface it is applied to, then acting as a deflector of EMI as well as RFI energy. RFI, or radio frequency interference, is extremely similar to EMI, except that it moves in free space instead of through electrical wire. Wire shielding protects the mechanical wire source from RFI waves as well as the EMI. Products that require the safety of wire shielding include televisions, telephones, industrial machinery run by way of electricity, computers, light sources and many more products. 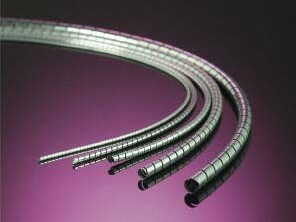 These are utilized in virtually every industry, therefore making wire shielding a common necessity. Wire Shielding Wire shielding is a specific type of EMI shielding that protects wires and cables from damaging electromagnetic energy.